Who doesn’t want to save on their energy bill? 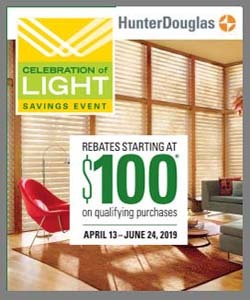 Energy efficient products are even more appealing when you can use your purchase to get a little rebate on your taxes. With honeycomb shades such as Duette Architella from Hunter Douglas, you can enjoy style, function, and a tax rebate from Uncle Sam! Federal tax credits for energy efficient home improvements have been reinstated. Even better, the credits are retroactive and can be applied to improvements already made in 2012, as well as those that will be done in 2013. At Windows, Walls, & More, we offer a wide range of energy efficient window treatments and installation options that will help you qualify for the tax rebates. The Duette Architella Honeycomb Shade Collection is an innovative window shade that brings you the industry’s highest level of energy efficiency. You can also select from a variety of child-safe lifting options, ranging from cordless manual mechanisms to motorized solutions that operate your shades with the touch of a button. Duette Architella shades can be custom made to fit a variety of window shapes angles, arches, skylights and cut-outs. 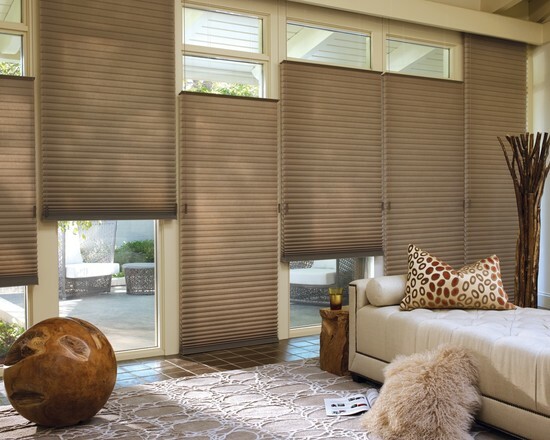 These classic and beautiful honeycomb shades take nature’s most perfect shape, the honeycomb, and double it to create an amazingly fashionable and energy-efficient shade. The Duette shade uses three distinct air pockets to trap cold air in the winter and heat from the sun in the summer to you pay less on your energy bill. This innovative installation feature is attached to a window frame to form an insulating barrier by sealing the gap between the shade and the window frame. Drafts are reduced, and energy efficiency is improved. The kit works with inside mounted LiteRise lifting systems, as well as the Top-Down/Bottom-Up Duolite option. The cost the LiteRise TrimKit is eligible for the tax rebate program when used with certain Duette® and Applause® honeycomb shades. You can lose as much as 50% of your home’s heating and cooling energy through your windows. All Hunter Douglas window fashions provide window insulation, offering your home increased protection against heat loss during the winter, and minimizing the sun’s heat during the summer. Some products have higher energy efficiency ratings than others. We can help you find the blind or shade that works for you and qualifies for the rebate. Not all honeycomb shades qualify for the tax rebate. The credit is based on the energy-efficiency rates of window treatment products. 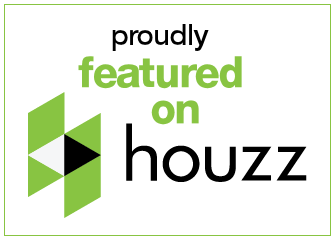 While most all Hunter Douglas window shades have some energy-saving benefits, some have a higher rating than others. Duette Architella honeycomb shades, for example, with their patented cell-within-a-cell design, are federally recognized as an energy-efficient product. These shades are so energy efficient they can reduce energy costs up to 50%. Available in vertical and horizontal pleats, our honeycomb blinds come in a wide range of fabric types, colors and shapes. Windows, Walls, and More has been your source for designer window treatments for discount prices since 1977. We can help you choose the energy efficient shade that qaulifies for the credit and provides you with the style and function you need. We proudly serve the areas of Bloomfield Hills, Novi, Northville, Bloomfield Hills, Birmingham, Franklin and more.